Look@OurBlog: Early Arrival, Norwest Private Hospital. Our third baby, Max, arrived a little ahead of schedule at only 29 weeks! This was a pretty scary time for us and something we had not been expecting at all! Although his health was pretty good from early on, Max did have to stay in hospital for around 8 weeks at the time. As you can imagine, trying to juggle spending as much time with our new baby boy as possible to make sure he thrived, whilst also trying to take care of our two other little ones who were only 4 yrs old and 2 yrs old at the time was very difficult! 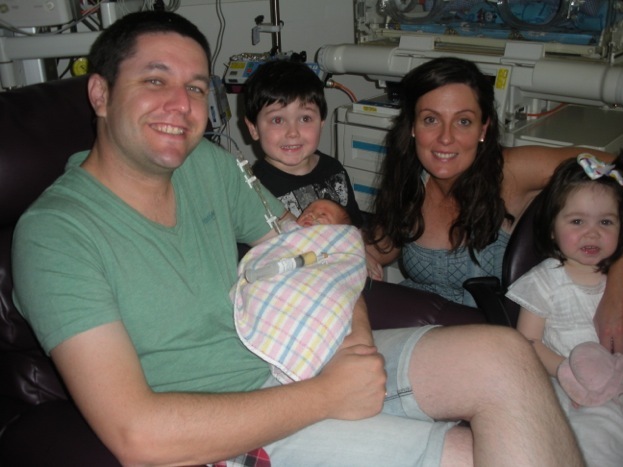 A couple of weeks after he was born, Max was transferred over to Norwest Private Hospital where we found out about the Look@MyBaby camera option. After discussing this with a couple of our lovely friends, they decided to get it set up for us as our baby gift! After all the worry when we couldn’t be with him (& countless phone calls to the nursery to check up on him), it was so amazing to see him whenever we wanted! My husband loved being able to show him off at work live on his phone and the kids and I would make sure he was always on the computer screen when we were at home! I remember the kids even kissing him goodnight on the computer! The rules were very strict around visitors in the special care nursery, which meant that only immediate family members could visit our little man. Once we had the camera set up, our relatives and friends were finally able to meet Max as well and would often leave little written messages for him on the Look@MyBaby site!! Max is now nearly two years old and I still can’t believe that he arrived so early. The 8 weeks he spent in hospital still feels like one big blur, and most days I can’t believe we actually made it through, but I am very thankful to the Look@MyBaby team who made our experience much easier to manage! Sally and family with baby Max. Thank you for this information.It helps people to find correct treatment and hospital.And can get quick treatment.